ADJ’s high-resolution AV3 modular video panel has a wide variety of potential uses. It is perfect for creating large display screens for use in touring productions and for one-off events where vibrant video playback is required to be seen over a long distance and it is equally-suited for permanent installation in all kinds of entertainment venues. That’s why it was the video product of choice when Phillip Trau of World of Stereo was contracted to upgrade the AV system at the River Rock Casino in Northern California. Located in the heart of Sonoma County’s world-famous wine country, nestled among the rolling hills of the Alexander Valley, River Rock Casino is one of the most accessible gaming facilities for the residents of the San Francisco Bay area. Owned and operated by the Dry Creek Rancheria Band of Pomo Indians, the Casino opened in 2002 and has become a popular destination for gaming as well as dining and entertainment. Recently, as part of a rolling program of renovations and improvements, River Rock’s management decided to upgrade the AV system in their main casino. Having previously utilized four 60-inch LCD screens, they decided to invest in something large-scale that would be visible from all around the venue and therefore have more impact. 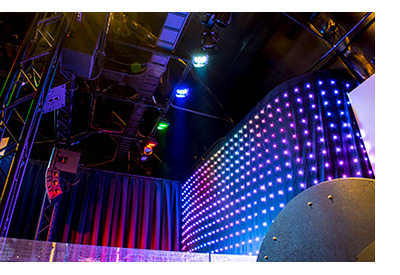 They approached Phillip Trau, the Outside Sales & Installation Manager for World of Stereo based out of Petaluma, California, who brought a variety of options to the table but it soon became clear than an LED video wall would be the optimum solution. Heeding Phillip’s advice, the Casino went ahead and purchased a 40-panel AV3 setup which has now been installed right in the heart of the Casino floor. Hung from a discrete powder-coated black Global Truss America goalpost, it can be seen clearly from all around the room and very much accomplishes the goal of generating a big impact. The screen is now in constant use thanks to an innovative control system that Phillip has implemented which allows Casino staff to easily select different sources and split-screen options directly from an iPad. The video wall is used to show sports games and TV shows during the day (sometimes as many as four at once using the split-screen function) and then ambient music videos late in the evening to create a lounge bar feel. It is also used to display commercial messages advertising special events and promotions, which means that it has become an integral part of the venue’s day-to-day operations. As well as installing the new screen, Phillip was also asked to upgrade the lighting on the Casino’s ‘Center Stage’, replacing an outdated conventional system. Used for live music performances as well as competitions and promotions, the stage required a flexible system that could provide bright illumination as well as rich colors and dynamic chase patterns. Phillip installed another Global Truss America Goalpost, this time loaded with 12 of ADJ’s powerful Flat Par QWH12XS LED fixtures, which he programed to run from ADJ’s myDMX 3.0 control software. This allowed Phil to setup a variety of preset Scenes and Chase Patterns that venue staff can now easily select to enhance the stage’s musical performances and promotional presentations. In addition, Phil also used 3 of ADJ’s LED Curtains to create an eye-catching dynamic background for the stage. By carefully considering the needs of his clients, and then selecting the right tools for the job, Phillip has created an AV and lighting system that is now used on a daily basis at the River Rock Casino. The combination of flexible quad color LED lighting and user-intuitive programming of myDMX 3.0 means the Center Stage is now equipped to enhance any performance or presentation with complimentary lighting looks. However, the AV3 is undoubtedly the star of the show! It serves as an attention-grabbing focal point for the whole venue, while providing the Casino’s staff with a flexible platform for displaying sports coverage, TV shows and internal promotional messages. 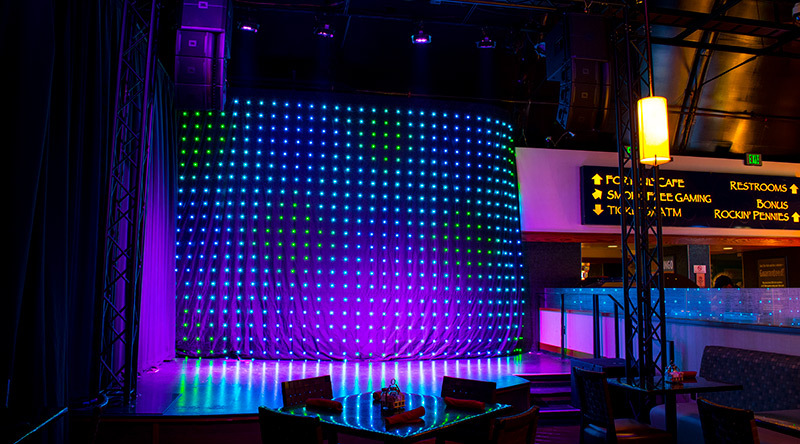 The River Rock Casino brings a little Vegas-style glamour and excitement to Northern California, and the newly installed ADJ AV and lighting system plays a pivotal role in making that happen.